For the first time in four decades, Harlem congressman Charlie Rangel’s name didn’t appear on a ballot, which meant a slew of long-waiting Democrats were vying for his seat. A total of nine candidates ran in House District 13, but two challengers garnered the majority of the votes: State Senator Adriano Espaillat and State Assemblyman Keith Wright. Espaillat edged out Wright — Rangel’s mentee and handpicked successor — to claim the Democratic nomination and, almost certainly, Rangel’s House seat come November. 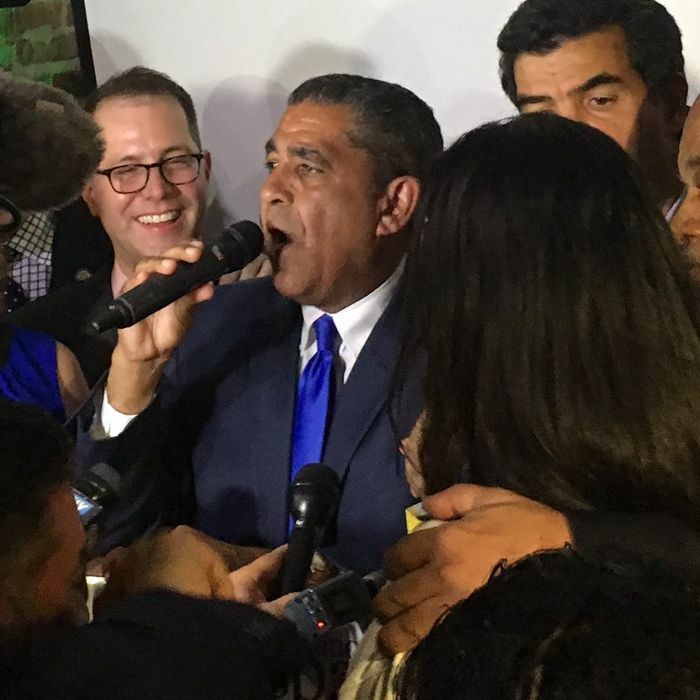 Espaillat will likely make history, too: He would be the first Dominican-American elected to the House of Representatives. On Long Island, another retiring representative left an open seat and many eager Democrats ready to step up and claim it. Democrat Steve Israel is stepping down, after 15 years in the House, to spend more time on his second novel. District 3, which stretches across Long Island’s North Shore in Nassau and Suffolk and includes a tiny slice of Queens, saw five candidates duking it out. Former Nassau county executive Tom Suozzi beat out his rivals with 35.5 percent of the vote, including Suffolk County legislator Steve Stern, whom Israel endorsed. Suozzi, whom you may remember from his long-shot gubernatorial primary challenge in 2006 against Eliot Spitzer, will face Republican state senator Jack Martins in the fall. The district is currently rated a toss-up, so it’s likely going to be a close race. A different long-shot New York gubernatorial candidate got another shot at public office Tuesday: Zephyr Teachout, who challenged but ultimately lost to Andrew Cuomo in a closer-than-expected primary race in 2014, won the Hudson Valley’s District 19 Democratic nomination. Teachout has never held public office before: She’s a constitutional-law professor at Fordham who wrote a book about political corruption — but she’s still a very popular progressive pick. The District 19 seat, currently held by Republican Chris Gibson (who’s stepping down), is also considered a toss-up, though it slightly favors a Democratic swing right now. Democrats would love to reclaim the district for themselves, and Teachout’s likely a much stronger candidate than previous Democratic contender Sean Eldridge, the husband of Facebook founder and former magazine publisher Chris Hughes. In November, Teachout will face ex-GOP state assemblyman John Faso, who, despite some voting-machine issues, beat out his GOP challengers. I am running for Congress to break down the doors of power in Washington. Most of the New York City Democratic incumbents skated through the primaries and will likely sail back to Capitol Hill in November. Carolyn Maloney (East Side of Manhattan, Brooklyn, and Queens); Gregory Meeks (Jamaica and Southeastern Queens); Nydia Velazquez (North Brooklyn, Queens, Lower East Side); José E. Serrano (South Bronx); and Jerrold Nadler (West Side, Brooklyn) all won out. And you can check out the complete election results here.